← SCHOOL LUNCHES AND BENTO BOXES – WHAT IS A MOTHER TO DO? One of our family traditions is creamed onions. No one eats them, but the whole family complains if the onions are not on the table. What nobody complains about is the bread dressing. 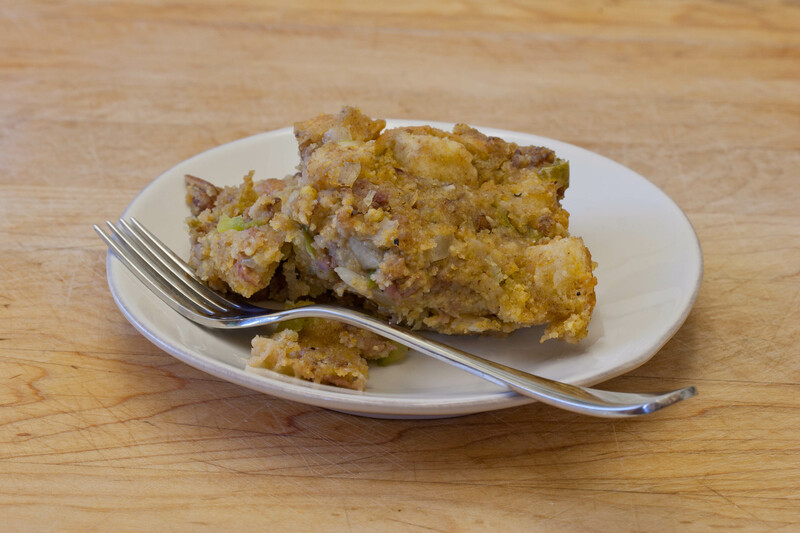 The recipe came from Susan’s aunt who used to visit the family around Thanksgiving-time and always brought good food and new recipes from Delaware. Her dressing has been an all-time hit so that we always double and usually triple the recipe to have plenty to eat with leftover turkey the next day. I suspect that she got her recipe out of a newspaper or magazine, because I have seen a lot of similar though not identical recipes since then. Still, this is a family heirloom which has to be made exactly the same every year. Our family Thanksgivings have been both days of joy and family happiness (There are three birthdays in November) as well as days of sadness when one of the clan has been diagnosed with a serious illness or when a loved one is no longer at the table. The day can also be one of discouragement for the cook or cooks who have been baking and preparing for days ahead. They often arise before dawn on the big day to put the finishing touches on the meal. Hours of hard work, sweat over a hot stove, and attention to details all seem to be for nothing when everyone sits down, only to have the meal disappear in a few minutes. That’s so folks won’t miss a minute of the football games on television or conversations around the fire. Mountains of dishes still have to be done by the kitchen crew. This year we are doing things differently. We will be going to the dining room of a local hotel where they will serve a traditional turkey dinner ending with a huge buffet of desserts. When everyone has eaten his or her fill, the leftovers get packaged up to take home for the next day. No hot work in the kitchen and no dishes to clean up. Everyone seems happy including the usual cooks. Still, we will miss AA’s all-time best bread dressing. We might even make some beforehand to make sure we have it on Friday. 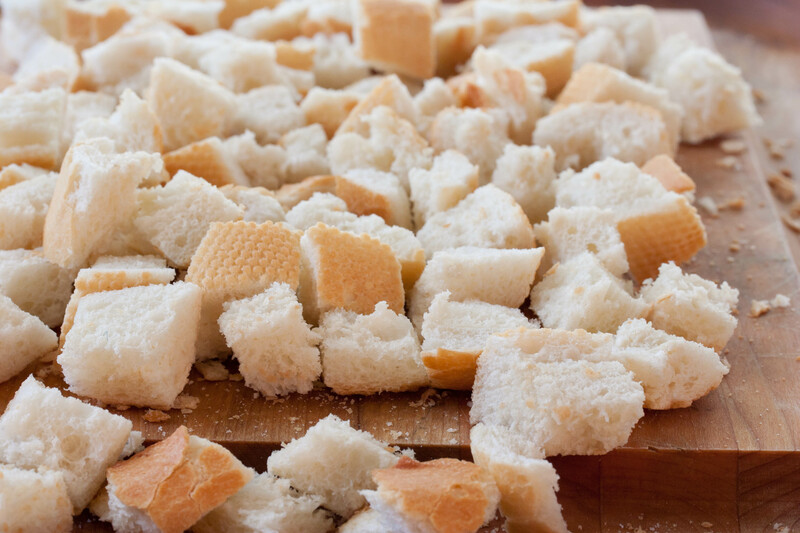 The day before, cut French bread into 1/2 inch cubes and spread them out to dry overnight. 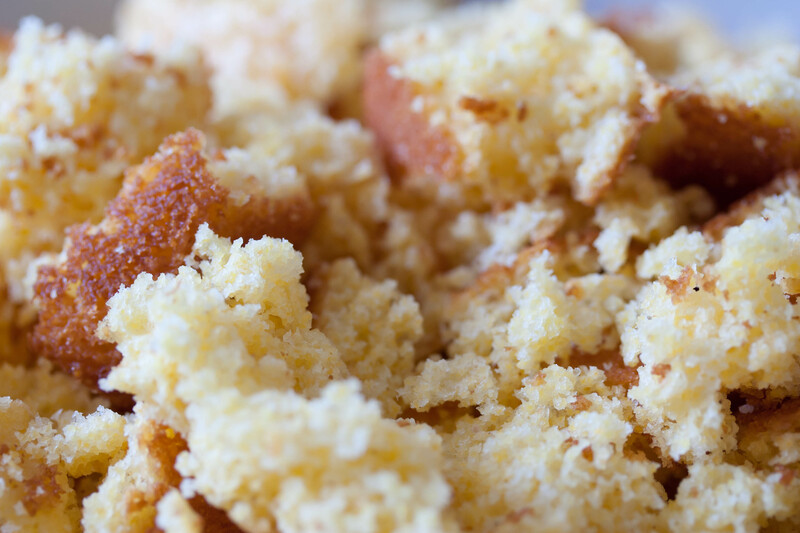 In a separate pan, crumble the cornbread and spread it to dry overnight. In a large, heavy skillet, saute the onion, green pepper, and celery in the butter until tender. Place the bread cubes and crumbled corn bread in a very large container. Dissolve the bouillon cube in the hot water and sprinkle over the dried breads. Stir in the sautéed vegetables. Using the same skillet, saute the sausage until browned and finely divided. Set aside. Add the salt, pepper, poultry seasoning, eggs, and pecans to the crumb mixture. Stir in the sausage and pan drippings and mix well. Bake in a large greased pan, covered, at 325 for 30 minutes. Uncover and continue to bake for an additional 15 minutes or until the top is nicely browned.